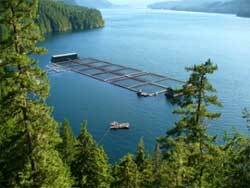 A very brief summary of the main types of mariculture is provided here. More information on these is available in the case studies of individual species. In seawater ponds, marine species are grown in ponds which get water from the sea. This has the benefit that plankton present in the seawater can be used as a food source. Some species grow well in tanks which are aerated and have a continuous exchange of water to keep the dissolved oxygen levels high and remove wastes. Algaculture is the type of aquaculture that cultivates algae. Most algae harvested is either microalgae (phytoplankton, microphytes or planktonic algae) or macroalgae (seaweed) which can be hard to grow. Microalgae are easier to harvest on a large scale. To successfully harvest algae, an algae farm needs the right temperature range, light source and nutritional characteristics in the water source. Algae is most commonly cultivated in open-pond systems, such as ponds, pools and lakes. However, these systems don't allow for control of light or temperature. Yet, they're the most popular type of pond system, since they're cheaper to build and produce the highest yield of algae. At the age of one young salmon are transferred to cages in the sea. The salmon are fed an artificial diet, specially prepared to maximise growth. Adults are harvested after two years wwighing approximately 3 to 4 kg. This method is used for offshore culture. It uses a series of styrofoam floats arranged in a row. The long-line is secured at each end with two anchors. One long-line is 100 m long and consists of about 51 floats connected by a polyurethane rope 15 mm in diameter. A series of strings of oysters called “rens”, each about 5m long is attached to each rope. Raceways are usually large concrete tanks, generally 30 m long, 3 to 10 m wide and 1 m deep and usually have higher flow rates than ponds. Fish hatcheries are used to breed a large number of fish in an enclosed protected environment. Such an environment greatly increases the chances of survival of the fish fry. Many hatcheries then sell the juvenile fish for release into the ocean (e.g. into sea cages). 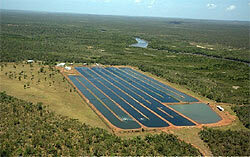 Integrated multitrophic aquaculture (IMTA) is a more advanced system of aquaculture. , different species with various nutritional needs are combined into one system. IMTA uses the waste products of one species as feed or fertilizer for another species. For example, seaweed grows from the phosphorus and ammonia that fish and shrimp excrete. 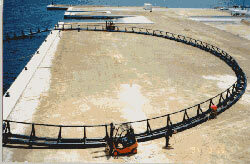 Shellfish feed on the solids that fish and shrimp produce. Although there are many different types and degrees of IMTA, the main principle behind the system is balance. An efficient IMTA is environmentally and economically sustainable because it recycles nutrients and increases profits. Harbour has five ponds built as raceways. Mussels and certain types of seaweed are grown with salmon. When the salmon releases waste like nitrogen or phosphorous, the mussels filter those waste particles. All the while, the seaweed is absorbing all of the nutrients in the process. Research has shown when the mussels and seaweed are introduced to a salmon pen, there is a 50% growth rate in both. More information on these types of mariculture will be available in the case studies of individual species.